NC Voting Rights Rollbacks: The New Selma? In March of 1965, the Selma-to-Montgomery march began with hopes of creating voting equality. 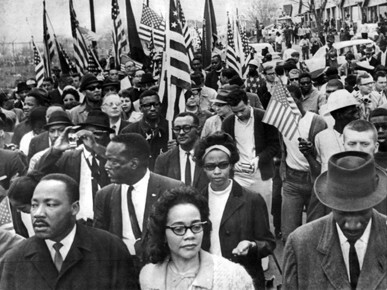 Hundreds of civil rights activists and demonstrators attempted to march from Selma, Alabama to Montgomery, Alabama in protest of Jim Crow voter suppression measures such as literacy tests, poll taxes, grandfather clauses, and the general practice of intimidation. Pivotal moments of the journey include “Bloody Sunday”—where non-violent marchers were viciously attacked and pushed back to Selma—and the right to peaceful protest being upheld by the law. The final result was the signing of the Voting Rights Act of 1965 in August of 1965. The victory of the Voting Rights Act of 1965—long fought and brutal—is being threatened again in North Carolina and states across the South. With the 2013 passing of the Monster Voter Suppression Bill by the North Carolina General Assembly, remnants of Jim Crow and discrimination can be found just below the surface. Some would say that this injustice calls for a Selma of our time to demonstrate our resolve to block the disintegration of voting equality. On Monday, July 7th organizations including the NC League of Women Voters (represented by SCSJ, The ACLU of NC, and the national ACLU) and the North Carolina NAACP (represented by the Advancement Project) will be in federal court in Winston-Salem advocating for a preliminary injunction against the new voter suppression laws (click here for a complete run-down on the lawsuit).With them they hope to bring support in the streets with the Moral March to the Polls Rally. For more information on the location of the march, please visit: http://www.naacpnc.org.